This program announces a Rotary International governor's banquet and ball to be held in Salina, Kansas, on April 12, 1948. The banquet coincided with a Rotary conference for the 122nd district held April 11-13. 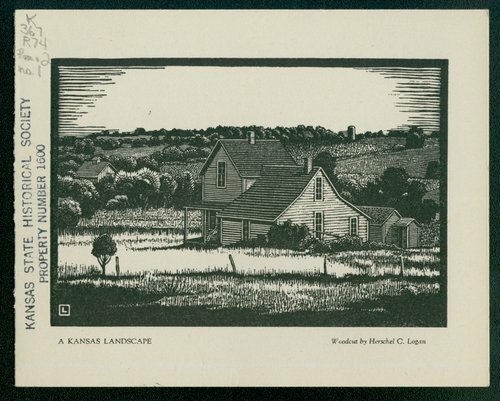 The program face features a woodcut print by Salina printmaker Herschel C. Logan titled "A Kansas Landscape." The Consolidated Printing and Stationary Company printed the program. Logan directed the art department at Consolidated Printing from 1931 until his retirement in 1968. Logan made few woodcut prints after 1939 following the death of his friend and mentor, Wichita artist Coy Avon Seward. Logan was a member of the Prairie Print Makers.